Decision making can be a critical process for any IT professional, but at the Country Fire Authority (CFA) it can be a matter of life and death. As a cancer survivor and father of an autistic child, Michael Foreshew took on the challenge in an effort to give something back to the community. Tell us about the IT setup at the CFA. It’s more than IT; ‘technology services’ is both IT and communications, as in radio communications. All up the team is about 90 people at the moment. We look after the traditional IT — the hardware, software, applications, architecture and the traditional things you expect to find in any significant IT shop — but we also look after 1800 radio towers, 35,000 pagers and 10,000 physical radios out in the field, plus all the communications huts. At the desktop level we have about 4000 devices connected to the network at any one time that can surge depending upon whether there’s a fire or an incident and whether we need to set up Internet control centres, which are regionalised command centres for managing major incidents. They’re predominantly bushfire incidents, but they can also be hazardous material incidents or any other incidents that affect the community and need to be managed. We work with a thing called the ‘off and connected’ network in that a lot of the time, particularly in the country, we can’t guarantee that communications will be there. The normal back-up of, say, 3G, is not always possible given the location we’re at. There just isn’t coverage. We often have to have degrees of resilience, but ideally we’d like them to leverage off the central network. We put in multiple communication paths where possible but sometimes it’s just not possible, so we work with ‘off and connected’ as opposed to ‘always connected’. Normal daily business operations all come back to a central location in Melbourne, but for incidents, predominantly we’re working with an ‘off and connected’. How difficult is it training volunteers on new or upgraded systems? It varies. In some situations it has been quite good, particularly when it’s an upgrade to an existing application, because people are familiar and confident with it. We’ve had some new systems that have gone in over the summer, such as our ‘One Source, One Message’ emergency alert and warning system. Because it’s brand new, a lot of people aren’t as confident with it as they normally would be, and that issue has presented some challenges in training. A lot more of the volunteers now have computers at home and are more confident with using technology and because technology continues to become ubiquitous around everything we do, people are coming in and using the systems more confidently. The benefit is I have about 61,000 people who are essentially doing R&D for me — so a lot of our volunteers are IT professionals. What are the challenges of sharing information among the brigades? Passing information between brigades works quite well. Certainly we can improve on it, though. We implemented Live@CFA before Christmas. It is an extension of the Live@edu suite that Microsoft offers. Microsoft donated, and we implemented for every single volunteer in Victoria, an email address, calendar, the whole lot, so that people can now communicate electronically more seamlessly. It’s not just incident information; it might be a local brigade running a car accident rescue training session inviting other brigades in the area to come and watch. Just as we have the physical communities, people brought together by towns and farming communities, we now have a virtual community, which is just as prevalent and relevant. During an incident it works quite well, particularly if you’re moving a lot of intelligence, be it field brigade movements, maps, weather information etc. What is the CFA’s most innovative use of technology at the moment? We have a CRM system! We call it community relationship management, more so than customer relationship management. There are basically two aspects to the CFA — the first is we have the volunteers and the staff who actually go and fight the fires. We also have a very strong push on fire prevention through an array of methods, education campaigns such as Captain Koala visiting schools through to smoke alarm awareness and working with town planners. The CFA covers the whole of Victoria, excluding metropolitan Melbourne, but including the major regional urban centres of Bendigo, Ballarat, Geelong, Shepparton, and Wodonga. We went live in October with our SAP CRM system, which allows people to book into what we call ‘community meetings’. The meetings are designed to educate on fire danger, what do to, how to build a safety plan, but the CRM also provides an information source for people during an incident. I’m very proud of the use of our CRM system and, as far as I’m aware, we’re only one of two fire brigades in the world using it. 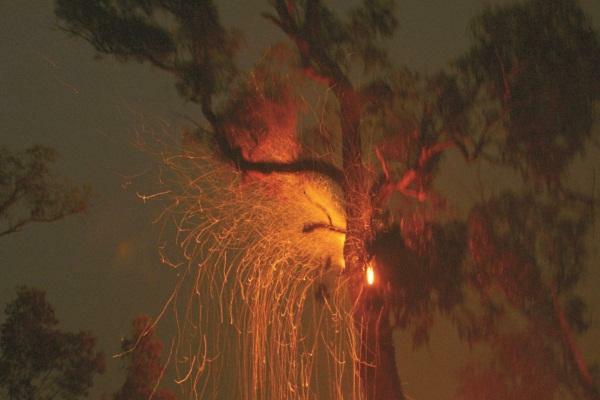 Could you paint a picture of what it was like on Black Saturday and how the use of IT helped fight the fires? Black Saturday was singularly the scariest, yet most rewarding day of my life. It was the most rewarding because I actually saw how an organisation like CFA just pulled together. It was nothing short of remarkable and it still makes the hair stand up on the back of my neck when I talk about it. From a technology perspective it didn’t create any extra stress on the systems because we planned for the peak, although we did have some website issues on the day because it was a peak far in excess of what we’d ever seen before. That was a problem we’ve since resolved. We’ve made a lot of improvements and it was the community information, the CRM system and going to meetings, that drove it. We lost some radio towers, but the contingency plans worked, the backup plans worked, and the several layers of resilience worked very well. It certainly put more load on equipment in terms of getting equipment out to locations. We scaled for the peak and I can say pretty confidently that on February 7 it worked very, very well, with the exception of the website. We had more fires after Black Saturday which you could see from the centre of Melbourne. We had twice the traffic on that day than the Black Saturday weekend combined. I was the duty officer that day. We take it in turns of having a support person that triages a lot of the IT — authorisation and co-ordination of dispatching equipment, issue resolution—acting in that co-ordination role as part of our overall incident structure. Problems range from broken fax machines through to losing a radio tower. The role is very key because it is the conduit to our controllers, whether it be the chief officer or his delegate, to manage the delivery of IT and radio communications. What’s in store for the CFA into the future? We’re expecting to be impacted by Royal Commission findings and not just at an IT level. It could also be on structure or management process, but technology is an integral part of any of these. We’ve just started the delivery on the second year of our five-year ICT strategy, so that will see continuous improvement work in terms of asset management, rostering and HR, staff management. It will be a very full year. Tags victorian bushfirescommunityHow do they do IT?